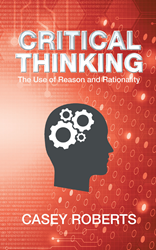 Recent release “Critical Thinking: The Use of Reason and Rationality” from Page Publishing author Casey Roberts is a collection of essays opining on a variety of topics such as science, faith, consumerism, NAFTA, Syria, and more. Casey Roberts, a writer and critic, has completed his new book “Critical Thinking: The Use of Reason and Rationality,” a thought-provoking series of essays on diverse topics relevant to modern American society. Published by New York City-based Page Publishing, Casey Roberts’s book offers philosophical musings on a variety of issues facing the United States today. Readers who wish to experience this thought-provoking work can purchase “Critical Thinking: The Use of Reason and Rationality” at bookstores everywhere, or online at the Apple iTunes store, Amazon, Google Play or Barnes and Noble.